Relax, there’s no hydrogen cyanide left in the buah keluak seed by the time it ends up in your meal here. The seed is found inside the "football fruit" of the keluak tree native to the swamps of southeast Asia – and thanks to that volatile acid, is highly poisonous. So why is it on the menu at this Auburn eatery? Here's why: they first boil down the seeds before burying them in ash for forty days. This allows them to ferment, and converts the flesh from a pale creamy colour to a midnight shade of black. Those seeds are the centrepiece of ayam buah keluak, a dark and spicy chicken stew fragrant with tamarind, turmeric and galangal. Ayam buah keluak ($29.90) is a mainstay of Peranakan cuisine. And those seeds are unlike anything you will ever taste. You’ll get a crab picker to scrape out the meat from within the partially cracked seed. The flesh is ominously black, nutty and medicinal – with an unmistakeable bitterness. You can try it for yourself at Peranakan Place, Sydney’s only restaurant dedicated to Peranakan cuisine. There’s not much signage out the front but the interiors are new and sparkling, filled with Peranakan trinkets and a smiling host who’s eager to explain everything. Like, for instance, what is Peranakan food? It’s the distinct strain of Malay Chinese cuisine which evolved in the 15th and 16th centuries in Malaysia and Singapore when Chinese immigrants integrated their food with that of the locals. 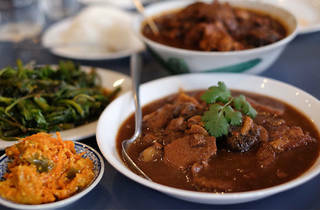 Also known as Nonya food – nonya means aunty in Peranakan – the cuisine fuses Chinese ingredients with Malaysian spices. That means a little coconut milk here, a feisty wad of shrimp paste there. There are plenty of less intimidating dishes on the menu, too. The shrimp paste fried chicken wings ($6.90 for four) are boosted by a salty prawn intensity that makes you lust after more. Pie tee ($9.90 for four) is another classic Peranakan dish. Little top hats of deep-fried pastry get turned upside and filled with cooked turnip shreds, prawn and coriander. 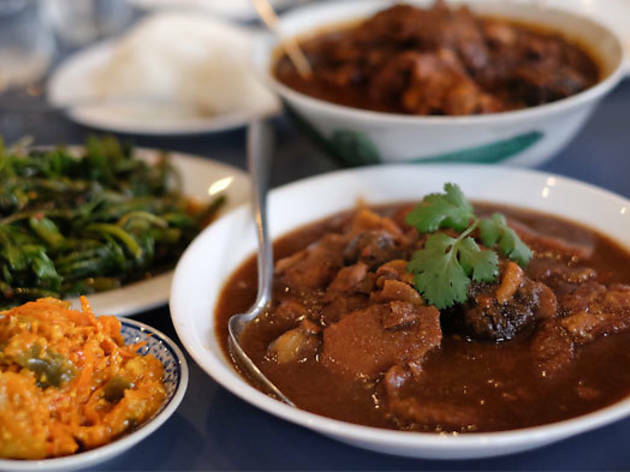 Splurge on the coconut rice and have it with babi pongteh ($16.90), a comforting stew of gelatinous pork trotters cooked with chestnuts and shiitake mushrooms. Go hard on the durian custard for desserts, either served in a choux pastry puff or drizzled over sticky rice. It’s also worth checking out the pulot hitam, a rice pudding made with chewy black rice sweetened with palm sugar and decorated with coconut cream. And here endeth the lesson in Peranakan food.